Felt is a non-woven textile that is made by shrinking or matting fibres together to make an impenetrable fabric, that can be cut without fraying or degrading the edges. Felt can be made from all wool fibres and other animal fibres such as alpaca, cashmere, angora and even buffalo. The basic treatment is either by wet-felting the fibres using a felting solution or dry-felting using felting needles or an embellisher. The two methods make a very different fabric and you have to decide what the final outcome is to be to decide which method to use. For example: I use dry-felting for making three dimensional objects that need a firm structure or embellishing onto a felt textile. I use wet-felting for creating soft fabrics such as nuno and cobweb felts, jewellery, hats, slippers, bags and felt mural and pictures. Sometimes I combine the two methods using dry-felted sheets in to create pictures or decorations on loose fibres and then wet-felt the complete piece. Laying down three layers of fibre makes a nice handled felt. Decoration can be added to the top layer in many different ways. If using a roving to create a design make sure that this is not twisted or too thick as this will resist felting into the surface. Fibres can be cut up to create a spotty effect and other fibres or yarns can be added such as silk to add to the design but a fine layer of wool fibres have to cover this to ensure that the design embeds into the felt. Using bubblewrap to work the fibres on gives you a cheap, clean and warm environment for fulling the fibres. 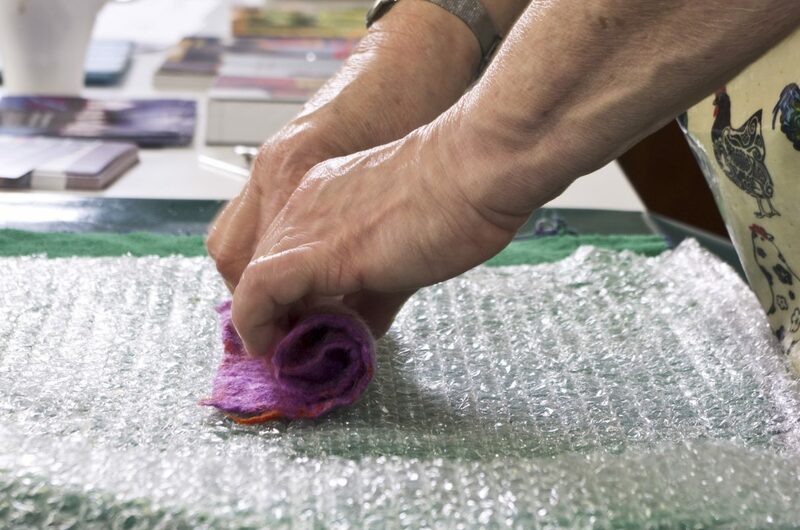 The felt can be rolled up on the bubblewrap to increase the shrinkage. This entry was posted in Interest. Bookmark the permalink.